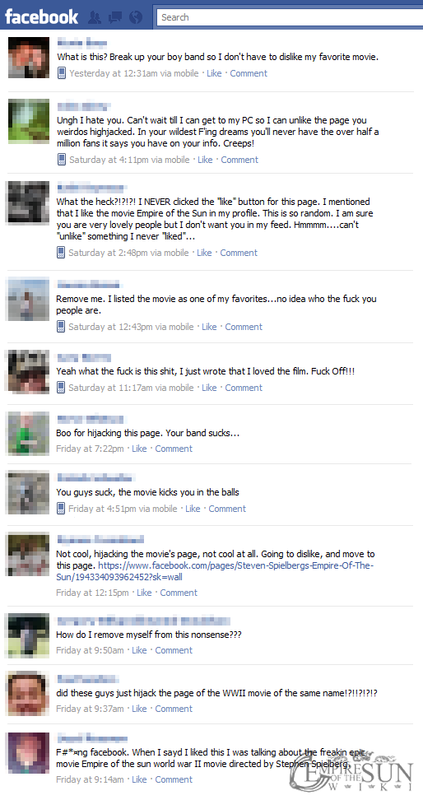 The angry Steven Spielberg fans commenting rudely on the bands official Facebook page. 26th August 2011: Today Facebook caused a huge glitch on the Like pages for both the Empire of the Sun's official Facebook page, and the Like page for Steven Spielberg's 1987 movie with the same name . The glitch caused that the Facebook users that liked the Spielberg movie on Facebook, liked the bands Facebook page instead. Giving them the feed from the band on their Facebook wall, making them outraged. The Empire of the Sun's Facebook page has never had so many negative and extremely rude comments day by day as it has now, because of the Steven Spielberg's movie's fans. Several fans of the band, tried to reply and co-operate, trying to calm down the angry Spielberg fans by typing comments such as: "There's a Unlike button" and providing them the instructions to be able to unlike the page for those who did not know how to do so. Some fans were even trying "converting" the hate towards the band into love, sharing suggestions such as "Try to give the band a try! - They are not as bad as you believe they are! - You should really listen to We Are The People, it's really good!". Though such suggestions sometimes upset the movie fans even more. The band, Empire of the Sun, as well as their fans, got accused by the movie's fans that the Empire Hijacked the Steven Spielberg's movie: Empire of the Sun's page stating that "It's EotS fault that I liked this page! - The fans and the band hijacked the movie's page to get more likes!". The accusation is of course untrue, it is said to be a glitch in Facebook where Facebook automatically mixed up the Likes because of the same names on both of the Like pages. Empire of the Sun Wiki, as well as some of the Facebook users, who are fans of the band, contacted Facebook to get this issue fixed. The issue has not yet been fixed, but hopefully will soon. The Empire has not yet commented on this situation, nor do they need to do so.